There are already several reviews on site but I have come late to van Dieren’s Symphony and have had the chance to mull it over. 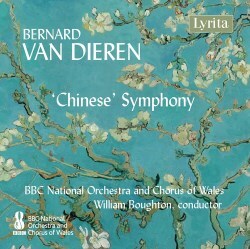 It was always more talked about than heard – that’s the way with van Dieren – but such a sumptuous and convincing performance as this encourages thoughts about the so-called Chinese Symphony which sets words from Die chinesische Flöte, Chinese poetry translated by Hans Bethge. The link with Mahler, who was similarly inspired by it, is unavoidable. The Symphony was composed between 1912 and 1914 and lasts in this performances 40-minutes. It’s separated into eight sections, duly separately tracked here, but in practice runs unbroken in one long multi-sectional span. It opens at the furthest reaches of audibility, so tremulously and indefinably that you’re not at all sure that your volume control has been tuned up. The orchestra’s pianissimo tremolo is spellbinding and has been captured with real engineering skill. The orchestral tapestry is deft and often delicately spun, and the vocal writing is often explicitly Delian – that for the baritone in the second section very much so – where the coalescence of Delian-inspired vocalism and Schoenbergian nocturnal in the orchestral writing vests the music with something of a piquant element. Chromatic free polyphony is van Dieren’s métier but his means include striking movements from intimate chamber-scaled orchestration – often single lines, as in a solo viola or duetting instruments - to quite lavish orchestration, something to be encountered in the Duettino for soprano and tenor. The quality of sublimated passion is strong in this work, and the Duet and chorus for contralto and tenor enshrines some especially beautiful wisps of writing for winds and horns. The long Interludio is a nocturne that reveals van Dieren’s powerful command of orchestral palette but one that is almost rigorously controlled, almost willfully self-contained in terms of colour and effect. This movement is influenced by Debussy but it also has the force of a Hokusai watercolour: not one of his famous waves but a landscape of defined but limited colour. Van Dieren achieves his effects through use of specific voicings: in the Cavatina for baritone it’s high winds, underpinning horns, the baritone soloist himself and strings – all create a complex tapestry of scales and lines. And in revisiting earlier material he manages to generate density of meaning – the Aria for bass (section seven) manages to generate a sense, through recapitulation of earlier material, of almost phantasmagoric cohesion. The orchestra works hard here, and the birdsong of the poem is rendered freshly in the scoring. The Mahlerian Quintetto and Chorus also admits Delian cadences in the vocal line and the work ends in a rather beautiful way. The five soloists acquit themselves with distinction and the chorus, a character in its own right, poetically and musically, is a vital component of the success of the performance. Above all the orchestral forces are on top form., outstandingly marshalled by William Boughton. There are two further works. The Introit to Toper’s Tropes comes from 1921 and was supposed to be the prelude to a work for chorus and orchestra which was, in the event, never written. It’s saturated in the ethos of Delius’s The Walk to the Paradise Garden but has elements too of the orchestral showpiece with lurching themes and a very abrupt ending. The Elegy – or to give it its correct title, Elegie für orchester mit violoncello principale, is a strongly Delian rhapsody with plenty of trademark wind detailing and a sense of melancholy to which Raphael Wallfisch responds with fine tone. It has a satisfying structure and attractive musical themes. Despite the difficulty of programming a 15-minute piece of this kind, it has had a performance prior to these recording sessions and that was way back in 1976 when that excellent player Christopher Bunting played it. Alastair Chisholm’s outstandingly good notes, coupled with Lyrita’s first-class recording, from ppp upwards, sets the seal on this adventurous and successful release.